Increased demand, intense government scrutiny, industry consolidation, new technologies and litigation liability are among the challenges the health care industry faces today. This ever-changing climate makes it critical for health care providers to partner with skilled legal counsel like Aaronson Rappaport to successfully navigate the complexities of this dynamic, highly regulated $3 trillion industry sector. Strategic Risk Management: We assist hospitals in establishing and maintaining strategies to reduce medical errors and to enhance quality of care. We present educational seminars to instruct hospital staff on best practices to avoid errors and to maintain compliance with all legal regulations. State Regulatory Compliance: We work with hospitals and nursing staff to support their efforts to achieve compliance with the New York State Health Code. We also represent doctors and hospitals during New York State Department of Health investigations, including those by the Office of Health Systems Management (OHSM) and the Office of Professional Medical Conduct (OPMC). Federal Regulatory Counsel: We counsel hospitals on all federal and state regulatory matters, including compliance issues involving JCAHO, EMTALA, HIPAA and others. 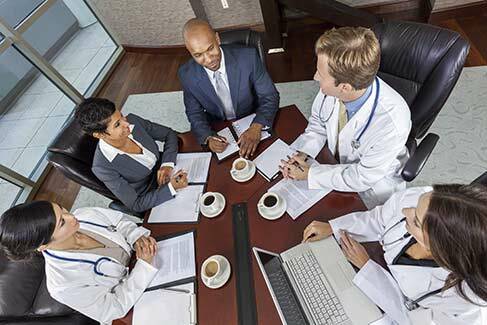 Transactional Matters: We represent physicians, small practice groups, ambulatory surgical centers and treatment centers on establishing and remaining compliant in risk management, corporate business practices, HIPAA as well as with the start-up, transfer and/or sale of a medical practice. Our trial lawyers are widely known for our unsurpassed legal, medical, scientific and technical expertise and, most importantly, for winning cases. We leverage this reputation to demonstrate to the opposition that we are fully capable and prepared to take even the most difficult cases to trial when necessary. Our trial lawyers produce outstanding results with time and cost-efficiency in a climate where health care defense lawsuits are expensive to litigate and can result in substantial fines and penalties. We represent New York’s most prestigious hospitals, including: Mount Sinai Medical Center, Mount Sinai Beth Israel, Mount Sinai St. Luke’s, New York-Presbyterian/Columbia University Medical Center, New York-Presbyterian/Weill Cornell Medical Center, NYU Langone Hospitals, Hospital for Special Surgery, Northwell Health, among others. We continually are recognized as a U.S. News – Best Lawyers® “Best Law Firm” nationally and New York City for Health Care Law. Our attorneys have achieved distinction among their peers: Martindale-Hubbell® Peer Review Ratings™, U.S. News — Best Lawyers®, New York Super Lawyers, New York Super Lawyers Rising Stars, Top 1% Trial Counsel among others. Please email contactus@arfdlaw.com for more information about our health care law – regulatory compliance practice. FDA considering expanding role of pharmacists and reducing role of physicians…really?